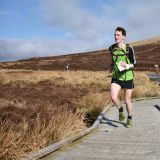 Leg 2 takes in Lough Firrib and either of the Three Lakes with the handover at Glenmalure hostel. Challenge: navigation and tough terrain in middle of leg. Leg 3 takes in Art's Lough and Kelly's Lough with the handover at Ballinafunshoge car park). Challenge: route choice and steep terrain. Leg 4 takes in the Upper and Lower lakes in Glendalough with the finish at Glendalough hotel. Challenge: a runner's leg but route choice could win out! If you have any feedback, please post it to the forum.